After Jason Zucker's power-play goal at 18:33 of the third period tied the game, Joel Eriksson Ek forced in a rebound just 26 seconds later for the winner. Eriksson Ek's goal stood after both a video review and a coach's challenge from the Winnipeg bench. Jets center Mark Scheifele opened the scoring with a power-play goal 8:53 into the first period. Scheifele leads all Jets skaters with 31 goals, though he hadn't notched a point in his previous five games. It took Winnipeg only 14 seconds to regain the lead. Ben Chiarot carried the puck into Minnesota's end and fired a shot that deflected off Patrik Laine for the score. Minnesota's Devan Dubnyk stopped 30 of 32 shots for his 25th win of the season. 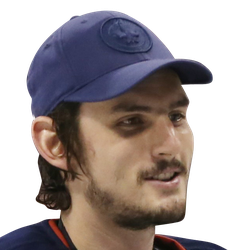 Hellebuyck saved 37 of 40 shots. Both teams had new faces on the ice following Monday's trade deadline. Kevin Fiala had 17:14 of ice time for Minnesota after being acquired in a trade from the Predators. Winnipeg made a league-high six trades on Monday, with new acquisitions Kevin Hayes and Nathan Beaulieu in the lineup against the Wild.